In 1963 Oscar Mayer, a brand of KRAFT in the United States, coined the catchy jingle to make his bologna a household name. "My bologna has a first name" and so on.. Yes, the song gets stuck in your head, but what is the sausage made of? 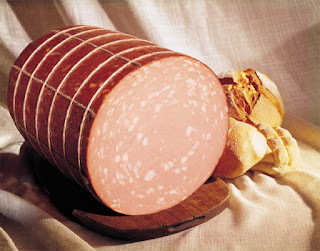 Mortadella, the real Italian Bologna sausage, originates right here in Bologna! Home to the Taste of Italy. The hearty, yet surprisingly healthy sausage has been made in the area for nearly 500 years, but has very little resemblance to the packaged, thick slices in the grocery store. Mortadella makers, using the traditional Italian style - leaving nothing to waste, use fat and spices to pack the thinly sliced delicacy with flavor. Often times the additions can literally be seen in the finished product. Though fat is used in the product, mortadella is relatively low fat. Only the tastiest fats are added into the sausage for the burst of flavor. Bologna, the city is better known as 'la grassa' or 'the fat' leaves nothing to the imagination when it comes to taste and enjoyment in the dining department. Like the Parmigiano-Reggiano and Traditional Balsamic Vinegar, the sausage must pass criteria to be the official Mortadella di Bologna. The genuine product is protected by PGI (Protected Geographical Indication). This means the products are free from fillers, artificial colors, flavors and preservatives. Mortadella is a must-try when wandering the small streets of the city. Appetizers with mortadella, sometimes with other meats are generally accompanied by some type of cheese which make great pallate pleasers before the meal. Yum! Oh, and just in case you were curious, the Oscar Mayer jingle is no longer used. The company wanted other products to be represented as well. I wonder what will happen to its Bologna sausage? One thing I am sure of, mortadella, the original Bologna sausage isn't going anywhere! Now that you have a grasp on the age old method for how the Traditional Balsamic Vinegar is made, let's go back a few hundred years into its history. Sadly, there is no official documentation when or where exactly Balsamic originated, but similar products, used in various ways throughout history have been mentioned in literature from ancient Greece and imperial Rome. However, some early documents for the still-flourishing condiment can be traced back to Modena 1598. Centuries later, traditional balsamic became a condiment for kings. King Victor Emanuel II was lucky enough to find the 'black jewel', a cask found in Duke Francesco IV of Ferrara's palace. The king demanded that the best casks being produced in the region be moved to the royal castle in Piedmont. Thus, began the royal balsamic batteries. Who knew balsamic could be a hobby for kings? A few years later, in 1860, author Francesco Aggazzotti took the time to write the practice to create traditional Balsamic vinegar. This became the basis for the production in Modena that remains today. Good thing someone decided it would be a good idea to pass on an actual recipe. Today, the production of the Traditional product can be found to Province of Modena in the region Emilia-Romagna in northern Italy. The province is home to more than great balsamic. The birthplace of Enzo Ferrari, several other noted automotive lines, balsamic and countless other gems make Emiglia-Romagna a must-visit in Italy.